In the top 10 comes the Holme Valley Sports Injury Clinic! Over the past 15+ years, between them, Jon (and Gerry!) have sorted out my back, neck, wrists and feet – and, probably, my head. Why? Because knowing that they can sort out my pain from gardening/box-lifting/skidding on ice/high heeled shoes, gives peace of mind. Jon has sorted out friends with back spasms and dodgy knees. 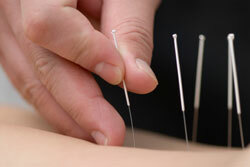 Acupuncture is one of the treatment techniques we use at the Holme Valley Sports Injury Clinic. We use it when appropriate and as part of the integrated approach we have for the management of pain, inflammation and as a means of enhancing the body's own healing chemicals in order to aid recovery and enhance rehabilitation. Acupuncture used alongside physiotherapy is done so within the background of clinical reasoning and evidence based practice. Acupuncture has been used for over 3,000 years. There are many theories as to how acupuncture actually works. The traditional (Chinese) view is that energy flows freely when the body is in a healthy state. If there is a problem, energy stagnates which leads to pain. The stimulation of appropriate acupuncture points by insertion of a fine needle frees this energy. When stimulating an acupuncture point the brain is stimulated to produce natural pain relieving chemicals called endorphins. These assist the body to heal itself and gain pain relief. Acupuncture does not work for everybody or every condition, but research shows that 70% of people gain relief after treatment. Positive reactions are often noted when more conventional treatment techniques have been unsuccessful. Often acupuncture has a cumulative effect where pain relief builds up as treatments progress. Some people react quicker than others. Chronic conditions often take longer to respond and occasionally become worse at first, but often respond well after this initial phase of discomfort. Our physiotherapists at the Holme Valley Sports Injury Clinic are registered with and regularly complete training courses to maintain recognition by the AACP. If you would like to enquire about treatment please call us on 01484 541227, or email us to tell us a little bit more about your injuries.